Valentineâs Day is coming soon – the time of romance, love, lust, flowers, cheesy Hallmark cards and more. So this is the perfect time to show just how much your vampire lover means to you. Hereâs a few gift ideas to help you out. Itâs a classic V-day gift, but instead of the clichÃ© diamond stud earrings or golden heart-shaped locket try to get them something a little more unique. If you want to stick to the classics you could get them this heart-shaped skull locket. Or you can go with this bleeding heart pendant. But if youâre planning to give them a promise ring, then Iâd check these out. 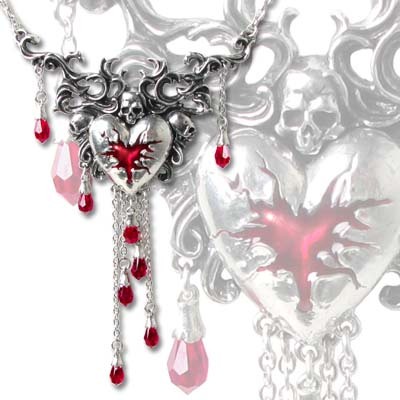 Alchemy Gothic has a lot of incredible gothic jewelry – see their website for locations. But if you are looking for something one of a kind, something no one has then check out Etsy. This is a site where people sell their handmade items, some of which are breathtaking. Ok, clearly this gift isnât for everyone. But if your vampire fan is looking for some Twilight goodies then this is perfect for Valentines Day. Here you can find Twilight themed candy hearts, cleverly titled âForbidden Fruits.â You can find these in most stores like Target and such. A lovely night for two is just what you love-birds need. Set the table, light come dark candles, break out the romantic wine glasses and get yourself a bottle of vampire wine. Do I even need to explain this one? Just picture him taking those off with his fangs. You remember those coupons you made for mom on mother’s day right? The promise cards mom could cash in that would say things like “do dishes” or “take the dog for a walk”. Well why not make your own vampire version, make coupons that say “one bite: wherever you like” or whatever your filthy mind can come up with. Ok, this one is a bit silly, but it’s fun. Make your vamp feel welcome. I am a big book bookworm, so a book would be a perfect gift for me, and maybe for your eternal love as well. I’d go for the vampire romance anthologies or some vampire erotica. If your vampire is a music lover, then I would so buy this amazing guitar. 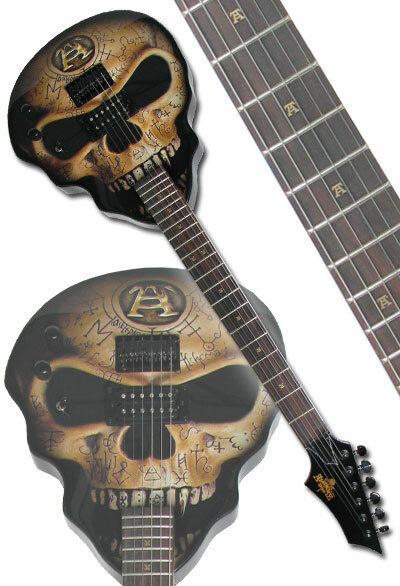 I mean, it’s a skull guitar! Awesome! Now you have a couple ideas that are sure to put a smile on you vampire valentine’s face.